Happy Halloween! This old postcard proved to be a minor mystery for me to crack, but I channeled the smarts of Velma Dinkley, Jupiter Jones and Encyclopedia Brown to come up with some answers. Read books and take the occasional short break for corny cartoons, kids! Then go help your parents with their chores. 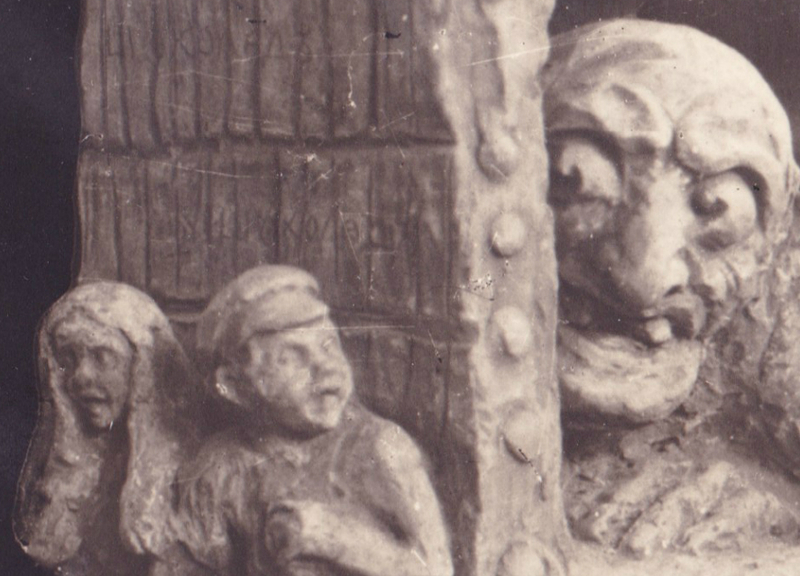 Anyway, this postcard features a sculpture of two children who are in peril and hoping to avoid capture by Baba Yaga, a witch of Slavic folklore fame who is sometimes nasty and sometimes nice. This appears to be the nasty version. Lady Yaga — Ha! Get it? I just made that up! — is typically envisioned as living in a forest hut that stands on sentient chicken legs.1 But, alas, no chicken legs are shown here. A initial Google reverse image search got me the name "Innocentiy Zhukov" and similar vintage postcards with amazing Zhukov sculptures. You can see a bunch of them — they're really fabulous — at HipPostcard.com. But I couldn't find any historical or biographical information about "Innocentiy Zhukov." Stumped, I finally typed in the Russian name printed at the bottom of the postcard: ИННОКЕНТIЙ ЖУКОВБ. Doing a Google search on that hit the jackpot. 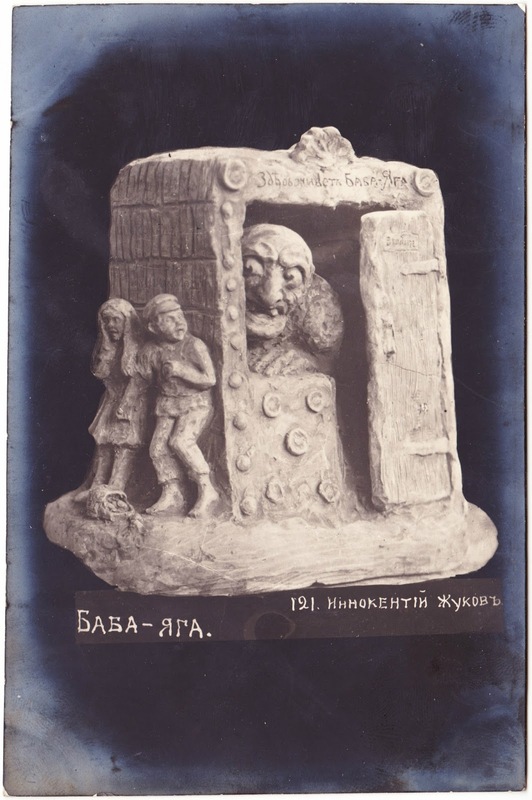 The sculptor of the Baba Yaga scene pictured on this vintage postcard was Innokenty Nikolaevich Zhukov, who lived from 1875 to 1948. (Innokentiy is another English-alphabet variant of his first name.) He was a famous sculptor, educator and writer, and he was a prominent figure in the scouting movement in Russia. He is described as an innovator, a humanist and a romanticist — an artist inclined to "talented fantasies." He was born in October 1875 in the village of Gornyi Zerentuy in Transbaikal, Russia. His father was a worker in a gold mine. One site states that "as a child, wandering through the forest, he enthusiastically searched for unusual roots and branches of trees and processed them with a knife, turning them into figures of animals, birds and people." As his education abroad continued in his teens, he focused on drawing, clay-modeling and wood-carving of these same subjects. He worked as an educator and, specifically, a geography teacher for about three decades. He taught Esperanto alongside Russian, which was uncommon for his time and place, and had books published with dual text in Esperanto and Russian. "Political utopia and science fiction — a widely used combination in the 1920s — joing up in this children's tale of eight boys who land in a beautiful, bright Communist future of Esperanto, glass cities, and aeroball in the distant year 1957." Clay model remained his favorite pastime, and he was mostly self-taught in that discipline. He became a popular artist, with gallery exhibitions in St. Petersburg and posters depicting his sculptures. He created more than a thousand sculptures of clay, gypsum and cement; what remains is scattered over private collections, museums and parks. One translated site described his artwork as reflecting "his passionate love for people, irreconcilable hatred for all oppression, for philistine vulgarity, for the abominable vices that are generated by capitalist society." "Baba Yaga is a bonifide badass who lives off the grid, has a private jet shaped like a mortar, practices herbalism and witchcraft — all the while wining, dining, and sauning beautiful backpacking strangers. ... Best thing, Baba Yaga’s costume is a totally low-key deal, which will allow you to show off your cool nonchalance. "Really, just wear whatever makes you feel fierce and you are basically a Baba Yaga. "As a bonus point, decorate your house with sentient chicken legs and use illuminated human skulls to light the way to the party." Veronika is kind of awesome.